2005 - 2006 First Annual National Youth Theatre Awards! National Youth Theatre is excited to announce the winners of our First Annual National Youth Theatre Awards to honor outstanding work in youth theatre, an outgrowth of the San Diego Playbill Youth "Billie" Awards. For this first year, forty youth productions were reviewed from four different states. Thank you all for your incredible work and all the unforgettable entertainment over the past year! 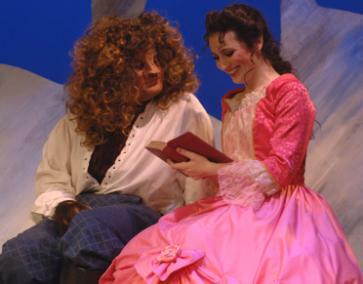 In addition to the youth who performed in the youth theatre companies, any minor (under age 18) who performed at a show reviewed by a National Youth Theatre reviewer was also considered for the awards, as well as the adults who participated in the youth theatre productions backstage (directors, set designers, costume designers, etc.). The winners will be formally presented with their awards at a ceremony honoring their accomplishments on Monday, June 12 at the Garfield Theatre in the Lawrence Family Jewish Community Center located in La Jolla, California. Home of J*Company for the past several years, they are generously donating the use of their state-of-the-art, 495-seat theatre space, as well as their professional assistance, for this year's festivities as they have for the past three years. In future years, as we expand the number of shows reviewed in different states, we hope to begin holding regional awards ceremonies. But for this year, all winners are invited to the San Diego ceremony.